This independent one day tour includes Forbidden City, Jingshan Park, and Beihai Park. In the early morning, you should get up early and get to the Forbidden City 7:30 to line up for buying a ticket. For this, the earlier, the better, especially when you tour is made on festival days or weekend days in the peak season. After the Forbidden City Tour, you are going to visit Jingshan Park to have a panoramic view of the Forbidden City, and then go to Beihai Park to have a beautiful and leisure tour. Facts: the Forbidden City is the imperial palace of the Ming Dynasty and Qing Dynasty, and it covers a huge areas, and has so many splendid buildings with exquisite and luxurious decorations. For more information about the Forbidden City, please visit Independent One Day Tour in the Forbidden City. Two tour plans: considering you don’t have enough time to tour the Forbidden City, here is a half day tour for you, and some halls or galleries are recommended to you. 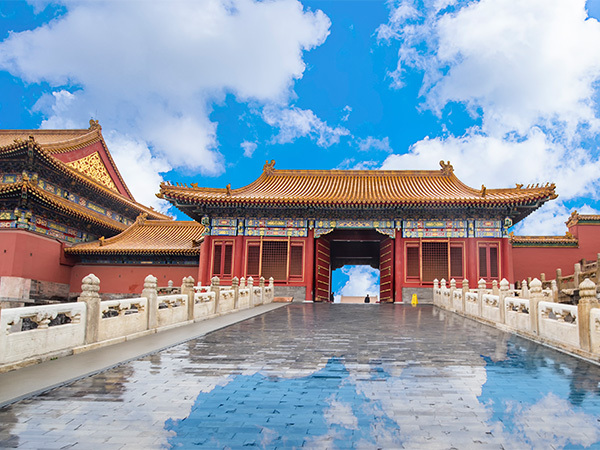 Half day is not enough for you to see all attractions inside the Forbidden City, and here are two plans for you, which contain six must-see halls. One is to tour along the central axis, and another is to make a tour to some galleries. Tour along the central axis: 1 the Meridian Gate (午门：Wu men) → 2 Gate of Supreme Harmony (太和门 : Taihe men) →3 Hall of Supreme Harmony (太和殿: Taihe dian) →4 Hall of Central Harmony (中和殿:Zhonghe dian) →5 Hall of Preserving Harmony (保和殿: Baohe dian) →6 Palace of Heavenly Purity (乾清宫: Qianqing gong) →7 Hall of Union (交泰殿: Jiaotai dian) →8 Palace of Earthly Tranquility (坤宁宫: Kunning gong) →9 Imperial Garden (御花园:Yu huayuan) →10 Gate of Divine Prowess (神武门: Shenwu men). Tour to Galleries: the Forbidden City has several galleries, and exhibitions, while those display works may be changed from time to time. There are 12 galleries, and they are : Exhibition "Discovering the Hall of Mental Cultivation: A Digital Experience" , Kulangsu Gallery of Foreign Artefacts from the Palace Museum Collection, Gallery of Historic Architecture, The Sculpture Gallery, The Jade Gallery, The Hall of Clocks, The Gallery of Qing Imperial Opera, The Treasure Gallery, The Bronze Gallery, The Ceramics Gallery, Gallery of Painting and Calligraphy. For exhibitions, the display works are not fixed, and you may check information about them in the official website the Palace Museum . 1 The Meridian Gate (午门： Wu men) → 2 Painting and Calligraphy Gallery & Hall of Martial Valor (武英殿： Wuying Dian) →3 Ceramics Gallery & Hall of Literary Brilliance (文华殿：Wenhua dian) →4 Gate of Supreme Harmony (太和门： Taihe men) →5 Hall of Supreme Harmony (太和殿： Taihe dian) →6 Hall of Central Harmony (中和殿： Zhonghe dian) →7 Hall of Preserving Harmony (保和殿： Baohe dian)-8 Palace of Heavenly Purity (乾清宫： Qianqing gong) →9 Hall of Union (交泰殿： Jiaotai dian) →10 Palace of Earthly Tranquility (坤宁宫： Kunning gong) →11 Hall of Mental Cultivation (养心殿： Yangxin dian) →12 Imperial Garden (御花园： Yu huayuan) →13 Hall of Clocks & Hall for Ancestral Worship (奉先殿： Fengxian dian) →14 The Treasure Gallery, Gallery of Qing Imperial Opera & Area of Palace of Tranquil Longevity (宁寿宫： Ningshou gong) →15 Gate of Divine Prowess (神武门： Shenwu men). After a tour in the Forbidden City, you go out from Shenwu men, cross the street, then you come to the South gate of Jingshan Park. Before your tour in Jingshan Park, you may have a lunch and have a rest. There are restaurants inside the Forbidden City, and also some in the outside and inside of Jingshan Park. Facts: Jingshan Park is the royal park, and has built for hundreds of years, is considered as a good place in Chinese Fengshui and a protection to the Forbidden City. In here, there are several buildings for leisure and rest, and some buildings has other meanings. For more information about Jingshan Park, please visit Jingshan Park. Sightseeing route: 1. first you buy a ticket of 2 yuan, go into the park through the front gate (the south gate). Close to the front gate, there are restaurants, and tourists service center. The you go straight and reach Qiwang Tower. Qiwant Tower, has two stories, built in 1750, with a height of 15 meters. In the past, a memorial talet of Confucius was put here to pay respects and homage to him. 2. After Qiwang Tower, you go up through stone stairs, and come to Wanchun Pavilion. Wanchun Pavilion is a grandly built building with three layers of eaves, and it is the highest and best sightseeing place in the central axis. In here, you could capture the panorama of the Forbidden City, and see this beautiful scenery in sunset, and also see the whole panorama of Beijing. From the east to west, there are five pavilions, including the Wanchun Pavilion. Two pavilions in its east side and the another two in its west side, and they all houses golden statues of Buddha in the past, which are looted by foreign armies in 1900. 3. Go straight along the central axis, you will come to Shouhuang Hall. Shouhuang Hall is splendidly, augustly built with the highest status, and has three decorated archways in the three sides of the square before the Hall. Shouhuang Hall is used to put Emperors’ bodies before burial, and stores the portraits of dead Emperors, and make worships to ancestors of the royal family. Each archway has three doors and four pillars with stone piers, and two divine animals, Kylin, lying on each stone pier. In front of the Hall, there are several pairs of lions in the square. 4. After visiting Shouhuang Hall, if you have interests and enough time, you may go the Yongsi Hall in its east side, then to Guande Hall. Next, go to the spot where Emperor Congzhen hanged himself, and then go to visit the five pavilions from east to west. Last go to the front door from Fulan Pavilion. If you like, you may wait to night time at about 19:00 and capture the night scenery of the Forbidden City, which looks gorgeous among lights. After going out from the front gate of Jingshan Park, walk about 200 meters to the Imperial Palace bus stop and take a bus, like No.124, No.103, for one stop and get off at Beihai Park bus stop. Or you may walk to the south gate of Beihai park with the help of GPS, Google Map or Baidu Map, for about 10 minutes. Facts: Beihai Park is the imperial park, and it is a resting place for leisure and sightseeing to the royal family. In this scenic area, there are many splendid buildings, plants and a big lake. In here, you may visit those old buildings, enjoy its beautiful scenery, and also ride a ferry or row a boat. You may plan your own tour route, a short one about 2 hours and a long one touring all places about 4 hours. 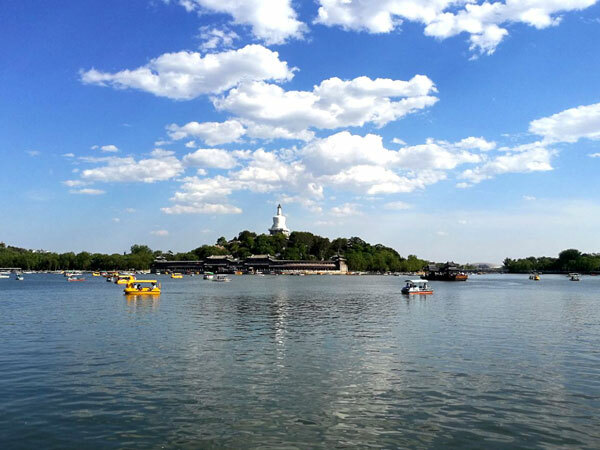 For more information about Beihai Park, please visit Beihai Park. Sightseeing route: first buy a ticket in the south gate and remember to see its map for a convenient tour. Then you go to the first part, Round City(yuan cheng), which have three small attractions, Yuweng, Chengguang Temple, and rowboat dock. Round City is designed in symmetry, and Chengguang Temple has a gorgeous appearance and houses Baiyu Buddha made from white jade, and go to have a look. Yuweng is container, said to be used to contain wine, and it is built in 1265, with vivid carvings of animals like dragon, and sea horse on its body. Certainly, you may rent a boat to tour the lake. Second, you go through Yong’an bridge to tour the second part, Qiongdao(Qiong Island), the main part of this scenic area, which has many resplendent buildings. In the central axis, there is Yong’an Temple, one of the most important religious buildings for Buddhism, BehindPu’an Temple is the White Pagoda which is one of the landmarks in here. Still, you may rent a boat, or take a ferry to tour the lake and go to the northwest part. Third, go through Sheshan Bridge in the east side of the Qiongdao, and walk along the east side of the lake to the third part. Then you will come Haopu jian, a garden of garden, where Emperors meet officers of high level, next, Huafang zhai( Painting zhai fasting), and then Xiancan Temple which is a place for worship and sacrifice. Last, you turn right and come the fourth part, which also have many buildings. In here, you are welcomed by Jingxin zhai, a garden of garden with water pool, stone bridge, pavilion, rockery and plant. Nine-dragon Wall is a famous attraction in here, and nine big, colorful dragons and over 600 small dragons are carved on a wall with a length of 25.52 meters. Then you may walk along the road in the west side of the lake. A night boat touring in the lake is a joyful thing, and gives you a different and unforgettable experience. I highly recommend this to you, if you have interests. In the end, you may go out from the north gate or the south gate. For your dinner, you have it at a restaurant in Beihai Park, or you may have it in a business street, like Houhai, and Wangfujing street. At the end of the whole day tour, you may find it will be at 20:00. Then you may go back to hotel and have a dinner, or you may go a business street and enjoy Beijing night life. If you choose the latter one, first you may go out from the north Gate of Beihai Park, then come Houhai, which is famous for its stores and its bar culture. Come to Houhai, do shopping in stores, and have a drink in a bar. Second, Wangfujing street is recommended to you, and you could take No. 103 public bus at the south gate of Beihai Park to Wangfujing street. In Wangfujing street, you can have a meal and eat Beijing snacks, buy handcrafts of Beijing style, and go shopping.